If you have been reading CosmoELEMENTS over the last few years, you will have realized that much of our understanding of Solar System history, including its earliest events, is derived from the study of meteorites. Scientifically, they are exceptionally valuable samples and, as such, it is sometimes hard to take a step back and realize that some meteorites have a cultural and historical value that is even greater. Back before the cosmic origins of meteorites were accepted, it is understandable that any material that fell from the heavens was the subject of some debate; historically, meteoritic material was often viewed as especially rare and valuable, as a gift from the Gods, or even cursed. Some examples that illustrate the prized nature of this material have been found in Egypt. A meteoritic pesesh-kef amulet was discovered in the tomb of one of the wives of King Mentuhotep II (Winlock 1921) and meteoritic beads have been found in the Gerzeh cemetery in Egypt (Johnson et al. 2013). Both of these items were buried with their owners, illustrating their precious nature. Meteoritic iron beads have also been found in the 2000-year-old Native American Hopewell Indian Mounds that now form part of the Hopewell Culture National Historical Park (Chillicothe, Ohio) (Prufer 1961; McCoy et al. 2008). The material from these beads derives from a meteorite fall in Minnesota, so it is likely that the material was traded through various native tribes before ending up in central Illinois (McCoy et al. 2008). 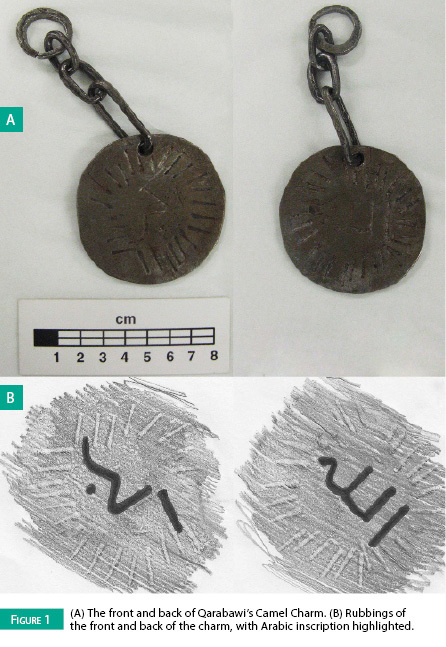 This again suggests that such material was seen to have value and significance. This was clearly an unusual purchase for the US National Meteorite Collection and, as a result, ten years later it was analyzed to prove its authenticity. Recently, interest in the charm was renewed and it was decided to investigate both the scientific and the anthropological–ethnographical history of the object. 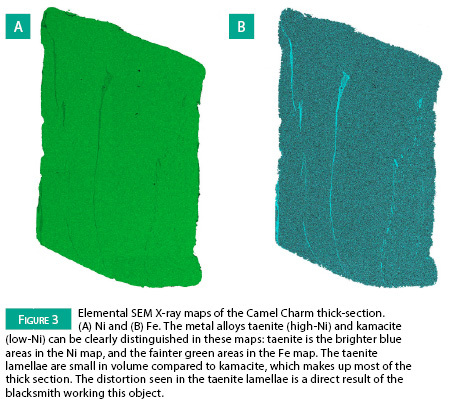 Figure 2 - Recent analysis of the Camel Charm used a scanning electron ­microscope (SEM) in the Department of Mineral Sciences at the Smithsonian Institution’s National Museum of Natural History (Washington, DC). This photograph was taken before that analysis was conducted and shows how the complete charm was loaded into the equipment. 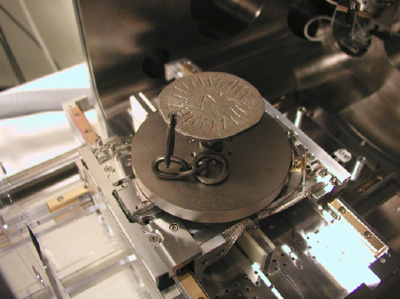 In order to confirm earlier analyses, the charm was analyzed using the scanning electron microscope (SEM) at the Smithsonian. It was found to consist of predominantly iron, with a Ni content of 6–7%, which agreed with the composition measured twenty years earlier (Fig. 2). The next question that arose was whether the Camel Charm was made from a new meteorite to science or a meteorite already classified and present in scientific collections. In order to be assigned an official name, each meteorite must be submitted to the Nomenclature Committee of the Meteoritical Society. Meteorite nomenclature strives to give a unique name to every meteorite derived from an individual meteor fall (with a few exceptions). This means there may be only one meteorite with a given name, or there may be hundreds: it depends on whether the meteor stayed intact. It is possible, therefore, that the Camel Charm is related to an existing meteorite (would have the same name) or it could also be a new meteorite (so given a new name); however, establishing which of these alternatives is correct required detailed analysis. The analyses to establish this as a new meteorite find, or match it with an existing find, required a small chip of material to be removed from the charm. When an object has cultural or historical value, it is important to preserve as much of it as possible: this means having to minimize scientific analysis because many analytical techniques are destructive. Clearly, the charm itself cannot be damaged; however, it was discovered that the chain on the charm is also made of meteoritic material with the same Ni content. A small slice was taken from one of the links in the chain and analyzed using an electron microprobe (Fig. 3). The Camel Charm was found to have a major-element composition almost identical to that of the meteorite Wabar, which is a meteorite from Saudi Arabia (Scott et al. 1973). This strongly suggests that Qarabawi’s Charm is a piece of the Wabar meteorite, although further analyses to confirm this are ongoing. Qarabawi’s Camel Charm contains an inscription on both sides written in Arabic that reads “Allahu Akbar,” or “God is Greatest” (Fig. 1). This fits with its suggested usage as a charm or amulet to ward away the Evil Eye from the camel who wore it. Belief in the Evil Eye has always been prevalent in the life of the Bedouin, such as the Ababda tribe, from whom the Camel Charm was acquired. Recent anthropological studies on the Bedouin tribes in the Negev region of the Middle East suggest that these beliefs continue to the modern day, despite rapid urbanization and availability of modern medicine (Abu-Rabia 2005). The practice of placing charms or amulets on livestock, such as camels, goes back centuries. These were often brightly colored beads, hung around the neck or between the ears of the animal; the Evil Eye would be distracted by the bead and diverted from the valuable animal (Budge 1961; Abu-Rabia 2005). The Ababda people exemplify this belief. This tribe live predominantly in the Red Sea Mountains of eastern Egypt, between the Nile River and the Red Sea itself (Murray 1953; Starkey 2000, 2001; Bos-Seldenthuis 2007). They are believed to be indigenous to Africa, unlike many of the other bedouin tribes who have migrated from other regions (Bos-Seldenthuis 2007). Traditionally, the Ababda worked as guides, helping caravans make the journey from the Nile to the banks of the Red Sea in safety (Murray 1953; Starkey 2000, 2001). Camels were, therefore, very important animals to the Ababda, providing not only transportation but also a means of carrying their belongings and goods for trade over long distances. As a result, they would be viewed as valuable assets to protect from the Evil Eye. The Bible even references such amulets around the necks of camels in the Old Testament (Judges 8:21). Clearly, meteorites are important for the knowledge they bring us about our Solar System and its formation. However, it is also important to remember that they can also be relics with great historical and anthropological value.